Today is my dad’s birthday. My dad grew up on a farm in the UP in a small town called Pelkie. He was the youngest of eight, the first one in his family to graduate from college. Back then MSU was called Michigan State College of Agriculture and Applied Science. 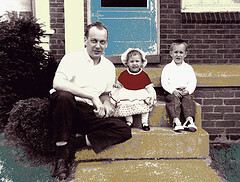 He married my mom in 1956 and they started their family of four, that’s me and my brother on the front porch with my dad in 1961. We grew up in Detroit and Novi and I am blessed with childhood memories that include trips up my dad’s family farm, a magical place for a small child where we took sauna’s together, ate squeaky cheese my Finnish grandmother browned in a wood burning oven, and where the night sky was lit with so many stars it made me dizzy to look up at it. Many adults carry the angst of their childhoods around on their shoulders, it weighs them down, it leaves them longing for something different, something better. I don’t. Instead, my memories are mostly jewel toned and washed in honey. Maybe it’s just the passage of time blurring the past, but I don’t think so. Happy birthday dad. This entry was posted in my life, photos and tagged family, my life, photos by Lilli Day aka bookbabie. Bookmark the permalink.